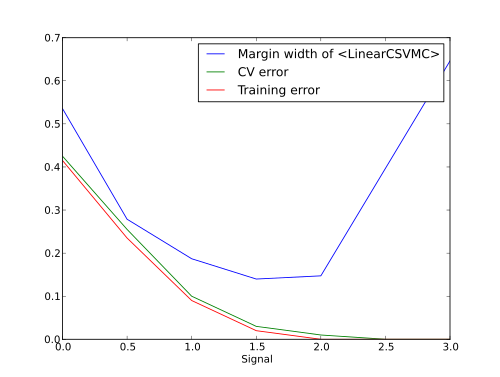 Width of the margin of soft-margin SVM (mvpa2.clfs.svm.LinearCSVMC) is not monotonic in its relation with SNR of the data. In case of not perfectly separable classes margin would first shrink with the increase of SNR, and then start to expand again after learning error becomes sufficiently small. This brief examples provides a demonstration. Generate a binary dataset without any signal (snr=0). To mimic behavior of hard-margin SVM whenever classes become separable, which is easier to comprehend, we are intentionally setting very high C value. So what would be our dependence between signal level and errors/width of the margin? The full source code of this example is included in the PyMVPA source distribution (doc/examples/svm_margin.py).